A new combined labor contract for the pilots of Alaska Airlines and Virgin America bumps up the highest pay rate to $251 per flight hour, just below rates at the four biggest U.S. airlines. A new combined labor contract for the pilots of Alaska Airlines and Virgin America, finalized Monday, provides hefty wage increases that bring the highest pay rate to $251 per flight hour, with increases of 3 percent in 2018 and in 2019. The current top of the pay scale is $216.46 per flight hour for an Alaska Airlines captain and $189 for a Virgin America captain (although no Virgin pilots have yet reached that 12-year level). The average pay increase is 16 percent for an Alaska Airlines captain and 29 percent for a Virgin America captain. The new contract, effective Wednesday and running through April 2020, also accelerates the pay of younger pilots by increasing the ratio of first-officer pay from 31 percent of a captain’s pay in year one to 41 percent, with corresponding increases in that ratio throughout the first five years of employment. 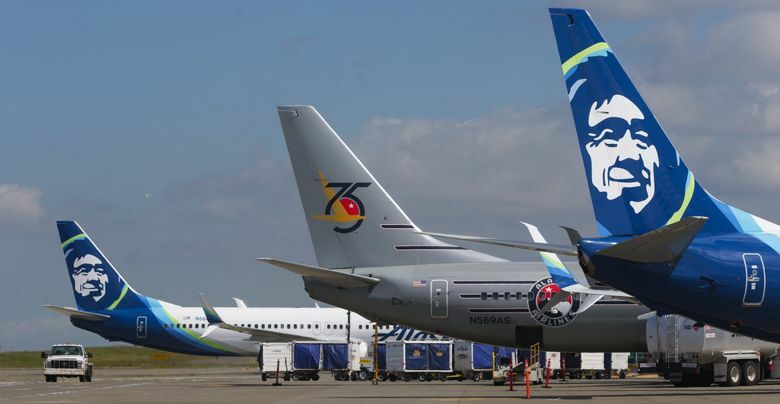 The contract provides an average wage increase of 28 percent for Alaska Airlines first officers and 45 percent for Virgin America first officers. The award places Alaska pilots at 5 to 6 percent below the highest rate in the airline industry. It also includes improvements to the 401(k) retirement plan for the roughly 1,500 pilots, out of a total 2,800 Alaska Airlines pilots, who are not part of the company’s defined-benefit plan. The pilots union, the Air Line Pilots Association (ALPA), expressed disappointment at the pay gap left between Alaska and the larger airlines, saying the contract’s terms would make it harder for Alaska to recruit and retain pilots. However, the arbitrators ruled that Alaska needs the slightly lower wages to be competitive because it is significantly smaller than the top four airlines and has a much more restricted route network. Alaska “cannot compete against Delta, American and United on the basis of network or on the frequency or breadth of flight offerings — it must maintain low costs to compete successfully,” the arbitrators wrote in their decision. Alaska Airlines spokeswoman Bobbie Egan said management respects the decision. “Our commitment is to keep our company strong with low costs, low fares and great experience for our guests while paying competitively. It is a delicate balance,” Egan said. The union had asked for a top rate of $261 per flight hour, with increases of 3.45 percent in 2018 and 3.7 percent in 2019. The company had offered $246 per flight hour with 2 percent increases in 2018 and 2019.